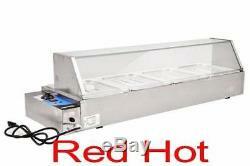 Omcan 42157 Commercial 4 Well Bain Marie Buffet Food Warmer Server FW-CN-1170. 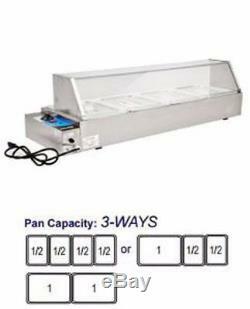 Electric Steam Table food pan warmer from Food Machinery of America. This Bain-Marie FW-CN series warmer is constructed with high quality stainless steel. It provides high-efficiency performance and equipped with an automatic thermostat. It is easy to use and very reliable. It has 4 wells and will hold four half size pans, 4 deep. Warmer is wet with no drain. This unit would be ideal addition to any restaurant, Hotel, banquet hall, cafeteria or school. IItem: 42157 Model: FW-CN-1170 Power: 1.5 KW Pan Capacity: 1/2-size x 4H Pans: 4 Temperature Range: 30-85° C / 86-185° F Electrical: 110V / 60 / 1 Net Weight: 16.2 kg. Dimensions (DWH): 13.78" x 46" x 12.40" Packaging Dimensions: 50" x 17" x 10". Not ETL are NSF Approved. This Will Help Expedite Your Order. It is our goal at Red Hot RESTAURANT EQUIPMENT to ensure you, as the customer, receive your merchandise with as little hassle as possible. We have provided some insightful information that can help to ensure you have a positive experience with our company. Please be Attentive to the Following. Item will be delivered curbside, the customer is responsible for carrying item into Place of Business. Liftgate is usually not needed on items under 100 lbs. Churches and Schools are usually considered residential. If there is Minor Damage you must notate the Damage on Driver's Paperwork before signing for it. If there is Major Damage, Refuse the merchandise. (Note) if the driver refuses to wait while you inspect your item, Write this on drivers paperwork Suspect damage, driver will not wait for me to inspect my item. We will repair or replace the item at our discretion. Please open all items you receive from us with in the 72 hour time frame. We do not except return items that are not in original Packing are that have been used. Our manufacturers provide warranties against all defects of material and manufacturing, as well as for defective assembling. We will not accept C. Please do not replace a customers product at no charge until you receive written authorization from OMCAN / FMA. OMCAN / FMA reserves the right to either repair or replace product at our discretion. This guarantee does not apply to abuse, willful or accidental damage, or to products used for other than their intended purposes. Any tampering or modifications to any product automatically cancels the guarantee. Items not covered by our guarantee include electrical components, which are subject to natural wear and tear. OMCAN / FMA denies liability for any damage or injury caused by operator neglect, carelessness or inadvertence. If there is Major Damage Refuse the merchandise. (Note) if the diver refuses to wait while you inspect your item, Write this on drivers paperwork Suspect damage, driver will not wait for me to inspect my item. The item "Omcan 42157 Commercial 4 Well Bain Marie Buffet Food Warmer Server FW-CN-1170" is in sale since Thursday, August 10, 2017. This item is in the category "Business & Industrial\Restaurant & Food Service\Commercial Kitchen Equipment\Cooking & Warming Equipment\Steamers & Steam Cooking". The seller is "drgriff" and is located in Niagara Falls, New York.